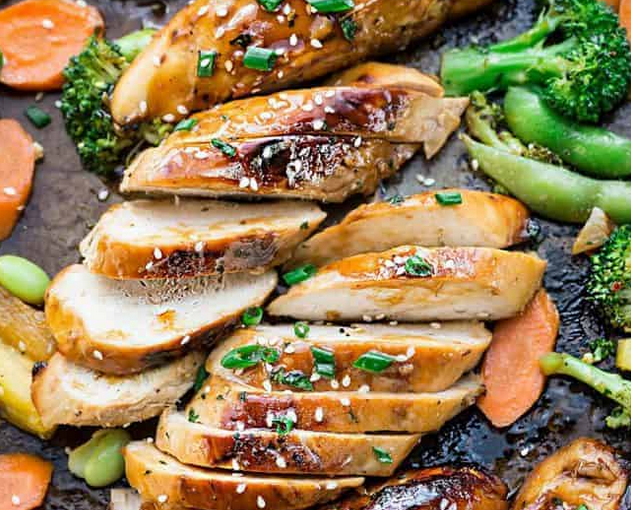 during a medium cooking pan over medium heat, whisk along condiment, honey, vinegar, sesame oil, garlic, ginger, starch and water till combined. arouse a simmer, stirring ofttimes, till sauce thickens and bubbles. take away from heat and put aside. heat kitchen appliance to 400°F. Line an oversized sheet pan with parchment paper or foil coated with preparation spray and put aside. Season either side of the chicken with salt and black pepper then drizzle spoonfuls of glaze over the chicken coating well on each side. Reserve a minimum of 1/2 the glaze for later. Cook in preheated kitchen appliance for twenty minutes then take away the pan. high chicken with further glaze, flip chicken and glaze once more. take away pan from kitchen appliance, slice chicken into strips and drizzle with remaining sauce. Serve over rice or quinoa and garnish with inexperienced onions and benni seeds, if desired. 0 Response to "Sheet Pan Teriyaki Chicken with Vegetables"